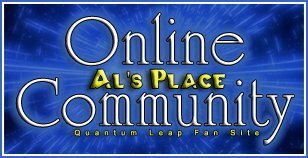 My name is Jonathan, I'm Australian and I love watching Quantum Leap! The show aired its last episode four years before I was born. It's never too late to become a QL fan, though! I have the complete series on DVD, and so far I'm having a blast going through the series. I'm up to season 5 currently, at the episode Deliver Us from Evil. I haven't fully watched it yet, but I'm glad Jimmy and his brother (his name escapes me currently) are both back! I love the Virtual Seasons, too. They're fantastic reads! It's awesome to see folks still discovering this show. I was 3-years-old when it premiered in 1989. I'm the same age as Torian Bellisario, creators Don Bellisario's and Deborah Pratt's daughter who played Teresa Bruckner in season 2's 'Another Mother'. I didn't watch until 2005, my senior year of high school with my best friend. I remember that feeling, watching the series for the first time. It was 2005, and seasons 4 and 5 were still due to be released on DVD. Naturally, it was a bad time for a couple of newbies to watch 'Shock Theater'. We were so impatient that I ended up purchasing a bootlegged series box set (though at the time I'd never heard of a bootleg so I thought it was legit). When it arrived we had a sleepover at my place and blew through the entire 4th season in that one night. IMO it never gets old. I might have to give the virtual seasons a read. I've read some but years ago. Hi Jon and welcome from Bedford UK. It is always a pleasure to welcome new members a-board!